EM 2008: David Villa at the Plaza de la Virgen »« Congratulations Spain! I’ll give you one guess as to how Valencians welcome the month of July. Hopefully you said “By Throwing a Crazy, Weeks-Long Fiesta”. If not, you haven’t been paying attention. This is the city which celebrates almost anything. It’s Tuesday, let’s dance on the street! My kid just lost his first tooth… ¡Mascletà! Your dentist appointment went well??!!! Lemme go get my Fallera dress on! La Feria de Julio officially kicks off tomorrow, July 2nd, with a set of traditional music in the Plaza de la Virgen, followed by fireworks (surprise!). Events occur every day throughout the month, until the 27th. 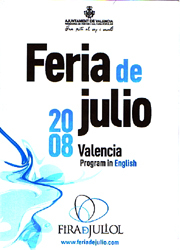 The Feria is Valencia’s best attempt to discourage its citizens from fleeing the summer heat. Really, it’s just a huge collection of random, officially-sanctioned events at 27 venues throughout the city. The selection of things to do is staggering, and far too expansive to list in detail here. We suggest picking up a free guide to the festival at any of the city’s Tourist Offices (available in English). We’ve already highlighted a few must-see events, such as the maritime entrance of the Christians & Moors, various fireworks, the street performances during the Gran Nit de Juliol (Sunday, Jul 12) and, yes, Ball Dancing for the Elderly. Hot summer nights, my homey. One question to our native Valencian readers — what is the Fallero Truc & Lado tournament? Googling this term results in 0 hits, although various Truc & Lado tournaments will be staged in the Jardines del Palau throughout the month! just wanted to say that during the “Feria de Julio”, the XII edition of the “Festival de Jazz” will take place at the “Palau de la Música”. thank you very much for the info – we might go to that free Jazz concert. It sounds really good. The “truc” is a typical spanish card game. You can find information about it in this webpage: http://club.telepolis.com/fallajmh/qslf/truc-c.html. (Try google Translate, it’s not that bad)… The competition is organized by the “Junta Central fallera” (Central Fallas Committee) and mainly all the “comisiones falleras” (committies) participate..